Had a relaxing time last night. It was certainly a bit cooler than the last few nights, due to the elevation. Before I left this morning I had breakfast whilst enjoying the view from the lookout. Looks like another sunny day. Was riding at about 8.30am, the road for the first few kms was more like riding in a quarry. Loose pointy stones everywhere. 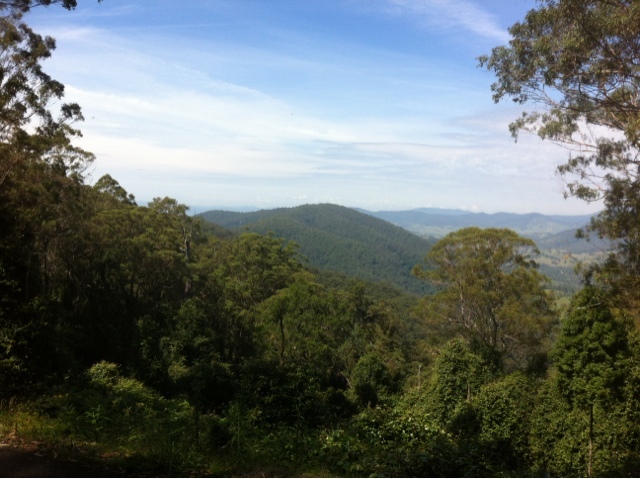 I stopped at the Thunderbolt lookout which of course gave me some great views to enjoy. I then continued on my way down. The road quality got a bit better, but I still needed to be careful coming down the hill. As usual there was very little traffic, except for this motorcyclist who stopped for a chat. I met a few touring motorcyclists on this trip, all very nice to talk to. My elevation dropped very quickly and I was soon cycling through rolling hills. They were so green, felt like I was in a scene from the "Sound of Music". So of course I started singing the songs I know. Think I've been by myself too long! At about 25kms the road leveled out and crossed a river a number of times. I was then back on the sealed road. This I knew would be my last major climb of this trip. The climb was on average about 10% and took me through the Copelands Tops. It was a really nice climb up and was mostly shady. 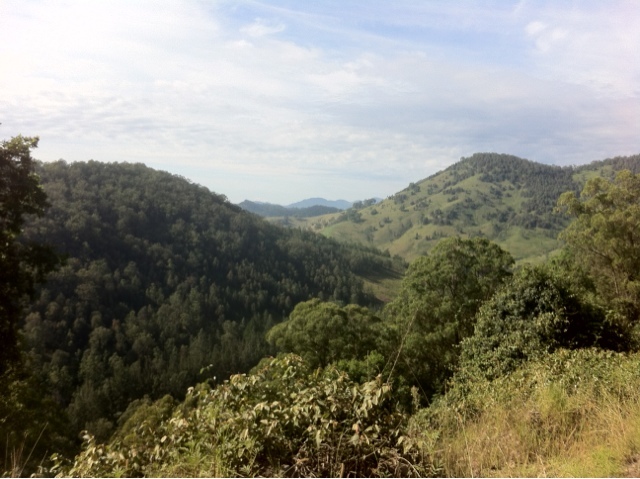 After about 4-5kms of climbing was at an elevation of about 650m. I then got to enjoy a nice fast descent down the other side. Was fun going 50+kph for most of the descent down. On the way down I noticed this caravan had broken down. I pulled over to see if they were okay, they said the vehicle had overheated and they were heading over Barrington Tops. Not sure if they'll get there, this was the only caravan I saw trying to get across the tops. The road is usually just cars, motorbikes and of course the odd cyclist. 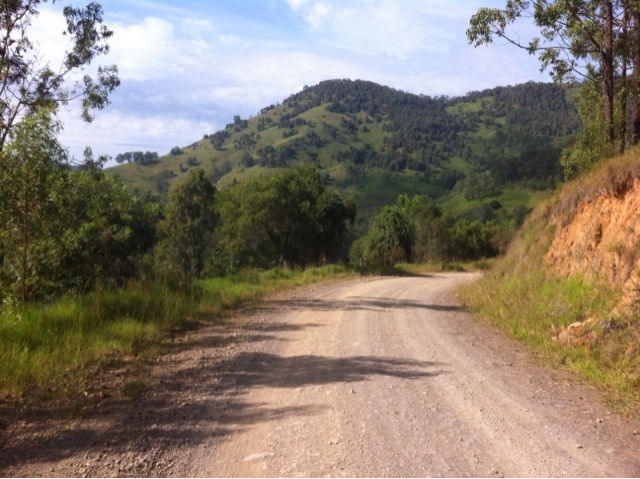 When I was down from the Copelands Tops I only had about 8kms to go until I got to Gloucester. It didn't take long to ride those last kms for the day, but it was sure getting warm. Thought it was meant to be getting cooler not warmer this time of year. Gloucester is a reasonable size town for the area. I stopped at the caravan park first and enjoyed a nice cold shower. Felt great getting the layers of dirt off and into some clean clothes. 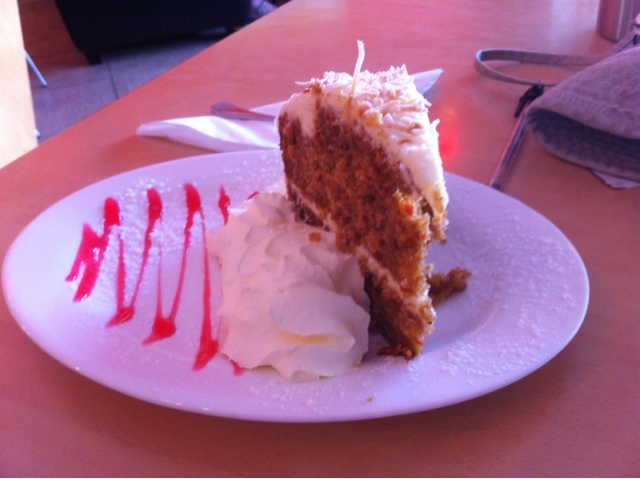 I then headed into town and found a nice cafe for lunch and of course cake after. Relaxed in the cafe for a couple of hours. 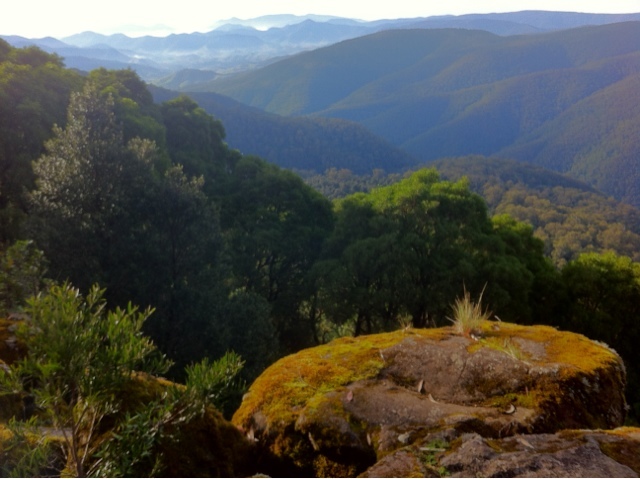 Was a lot of fun spending some time in Barrington Tops. I really enjoyed the peacefulness of my campsite last night and enjoying the views today. 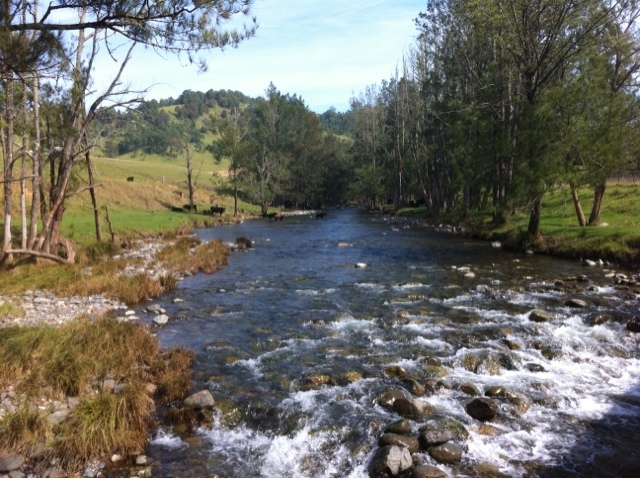 I'm getting towards the end of my tour and will be heading for Dungog tomorrow.